For chilled water, hot water, air, gas, oil, steam pressure and many low pressure applications. See table below for available ranges. 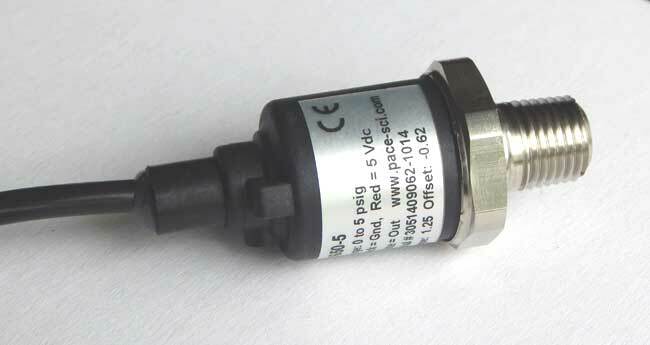 For higher pressure ranges see P1600 Pressure Sensors. P1650 Sensors can be read in any pressure unit (psi, kPa, bar, inches H2O, etc. ); see XR440 Pressure Converter or XR5 Pressure Converter. The 10 FT (3 meter) cable on all P1650 Pressure Sensors may be extended up to 100 FT (30 meters) by the user using three conductor 22 gage cable. In electrically noisy environments we recommend using shielded cable. © 1996-2018 Pace Scientific Inc. All rights reserved.